Abacus (2010) was displayed as part of The Museum of Futures' visual text exhibition in Surbiton (London, 2017) curated by Molly Bergin, Steven Fowler et al. In September 2013 sixteen apples were picked from the same tree (edible variety: Discovery) in a domestic orchard in South Somerset. Each apple was placed on an A5 sheet of cartridge paper (taken from the same pad) and stored together in similar conditions. The variety of each apple's response to this shared set of conditions was considerable, as testified by the variety of marks left by each apple on their respective pages. This series presents these same apples (surface, middle and mark-maker) displayed alongside the marks they made. The authorship of each page is distributed. Author: Camilla Nelson + sixteen discovery apples + bacteria + fungal variants + insects + sixteen sheets of cartridge paper + domestic + orchard environments (2013-2014). 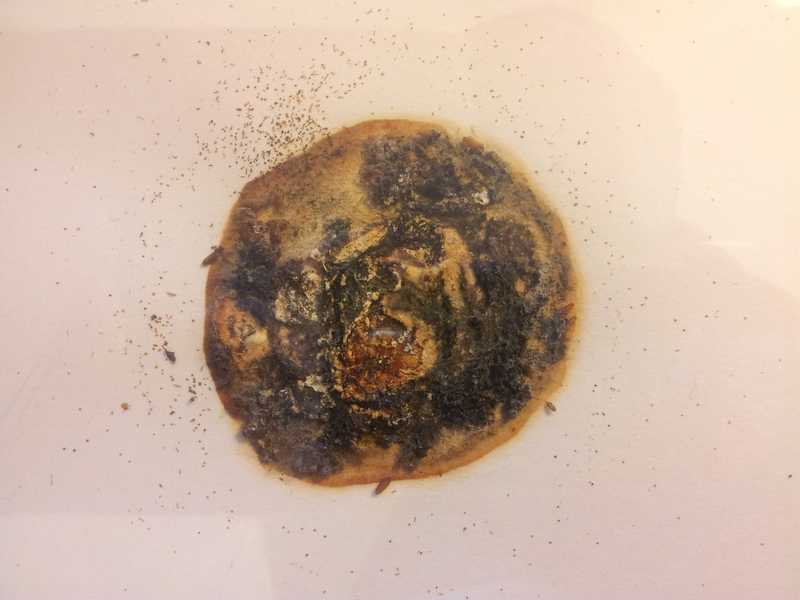 Exhibition & Publishing History: Four pieces from The Same Apple were shown at The Centre for Culture and the Natural World (CCANW) in Exeter, as part of Elizabeth-Jane Burnett's exhibition The Trembling Grass (25 October – 1 December 2014). More images from this sequence were published in The Clearing (May 2015). Four works from this series were exhibited as part of ‘Making Beyond Words – Intersections Between Text, Image, Display’ at Bath Spa University, Corsham Court (June 2017) and A is for Apple at Herne Hill Gallery in Brixton (October 2017). Pages & Pages: Appling (2009-2012) is series of sixteen pages composed of ‘tree’ materials (leaves, apple mulch, grass, lichen, moss and rainwater gathered from, on, or beneath, one apple tree in Tremough Campus Orchard, Falmouth University) and the printed pages of my confirmation of route PhD submission (Reading & Writing with a Tree: Practising Nature Writing As Enquiry) mulched together in my bath (with its ghost of the human body) and re-made into pages using wire mesh and hand-made paper-making frames (re-used from old picture frames) to produce flat, rectangular, physical impressions of this human and other-than-human amalgam. Elements of this tree environment, combined with those of my home environment, conspire to produce a page structure expressive of the material intersection of human and tree domestic ‘ecologies’. In this amalgam background and foreground (and accompanying power dynamics) are neutralised. 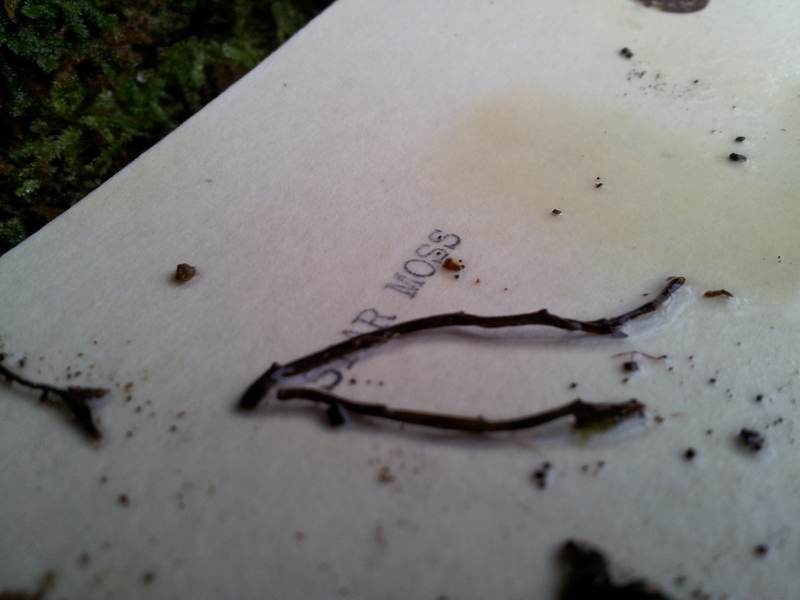 Grass blade covers word and word covers leaf. All are ‘contained’ within (this particular expression of relation is made possible by) the framing structure of the page. Each page presents a material ‘freeze-frame’ of the particular relation of these elements (weight, form and mass tree / natural / other-than-human elements in relation to the paper-making frame, wire mesh, bath tub, and rain and tap water), archiving their interrelation at a certain point in time. Each page is a place of intersection, the static rendering of a particular set of space-time, human and other-than-human, material relations. Each page provides a symbol, or an objectification, of the conceptual processing (the thinking together) of words and trees and pages. This installation explores the relationship between environments of reading and writing as part of my PhD final submission. The full thesis, 'Reading and Writing with a Tree: Practising 'Nature Writing' as Enquiry' (Falmouth, 2012), can be accessed at The British Library, Falmouth University or through the University of London website. For information on this installation and the accompanying research please get in touch. 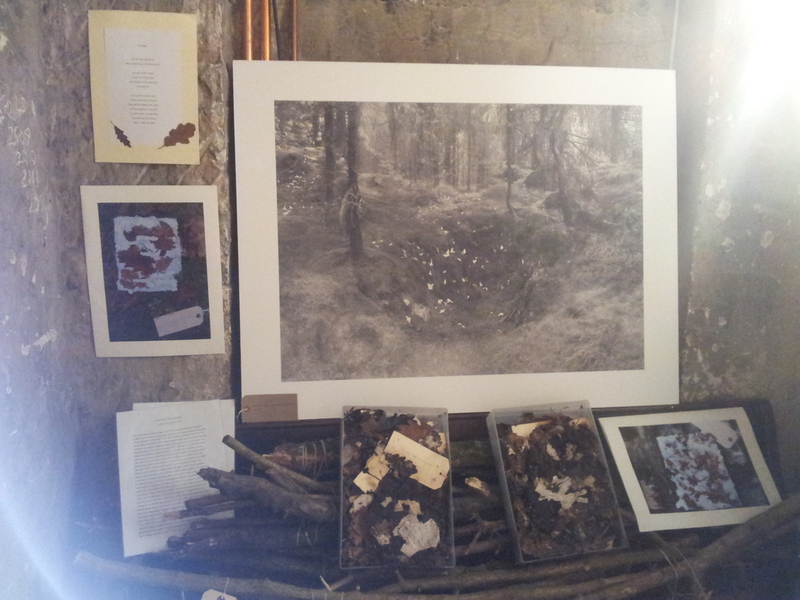 This piece was created for Assemblage: Narratives in a Managed Landscape, an art event in Yarner Wood (Dartmoor), curated by Karen Pearson with the kind permission of Natural England (November 17th/18th and 24th/25th 2012). Paper Trail included approximately twenty pages, and numerous paper fragments, arranged along the mapped Assemblage trail in Yarner Wood. Each page was situated at the place from which its original composite materials were sampled. These pages have been assembled from a selection of physical materials taken from specific sites within the wood and combined with selected biological, geological, historical and personal paper narrative accounts published by an array of different authors about Yarner and the great range of life it encompasses. The sites from which these pages have grown will now imprint these pages with their own particular elements, as the pages react to the physical conditions of these sites, altering the narrative. This work asks, who or what writes here in this wood, and how? Who is the author(ity)? What is the work? This work developed out of the Yarner Paper Trail (2013) and was exhibited as part of Time, the deer, is in the wood of Hallaig: An Exhibition on Forests, History, and Social and Environmental Memory, curated by Amy Cutler, in the gallery of St John on Bethnal Green (London) from 6th-11th June 2013. Materials for reading, writing and mark-making are threaded into a web between the branches of two oaks on The Green, in order for readers and writers to use them to express their environment, verbally and non-verbally, using the pages provided. These pages will then be published as part of the physical web. This installation is designed to inspire a playful exploration of the materials local to the area, and to encourage an expanded understanding of writing practices and materials in relation to environment. 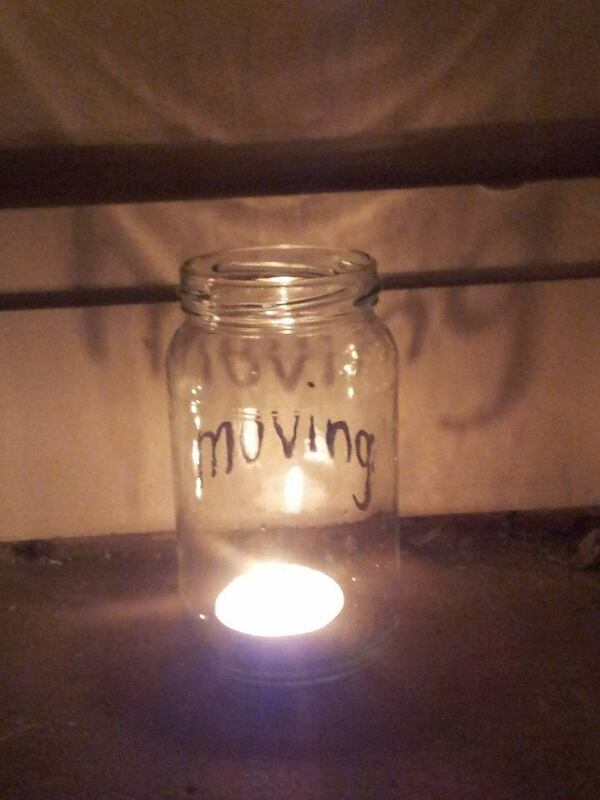 This piece was created for Still Points : Moving World, a performance writing exhibition, curated by Fay Stevens as part of the Bath Fringe Festival (Friday 23rd May to Sunday 8th June 2014). A cascade of pages hang from a series of interconnected mobiles. Each is hung with pages reformed from the pulp of poems written for Millennium Green (Forest Hill, London) and materials (earth, plant, grass, tree matter) taken from this site. Each page is a conglomerate piece. Some of these pages are composed from the pulp of writings and materials I gathered from this site in preparation for the Little Ecological Arts Festival held in Millennium Green (May 2013). These pages acts as a solo voice, singing amidst the strength and diversity of a choir. The majority of these pages have been reformed from the pages that comprised ‘Tree Book’. ‘Tree Book’ was an installation made out of the inscriptions and materials inserted into pages hung from an oak tree over the course of the Little Ecological Arts Festival (2013). Upon disassembling ‘Tree Book’ a small portion of each page was cut out and kept. The left over material was pulped. New pages were formed from this pulp. A fragment of each original work was included within the pulp of every new page. Each new page, reformed from the cumulative pulp of ‘Tree Book’, registers the specifics of the individual work in relation to a community of site-specific materials and inscriptions. When the light shines through, each page reveals itself as a static, suspended solution of the otherwise mobile solution of people, place and language. 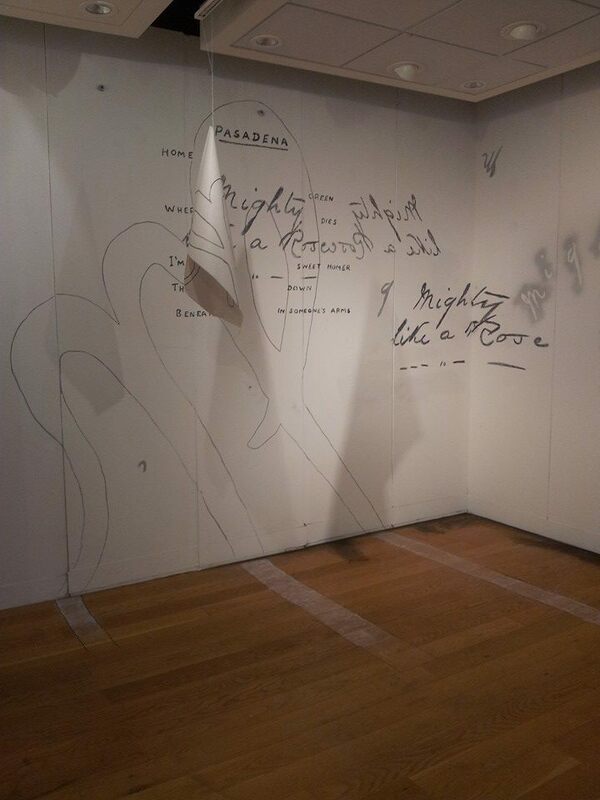 An installed writing performed by a group of artists working collectively under the name of Stanza. This work drew from the artwork and the gallery space of Fay Steven's curated exhibition Still Points Moving World. As well as making reference to T.S. Eliot’s poem Burnt Norton, our work was also guided by a magic lantern (dated to 1890s) and a collection of old glass slides. Stanza Collective: Fay Stevens, Jerome Fletcher, Mervyn Hear, Leona Jones, Chaucer Cameron and Helen Dewberry. In Lieu, Stone Writing and Sloe Writing were performed and installed as part of GATHER (2011). Gather took place In September 2011, at Goongillings Farm, located in an area of outstanding natural beauty, featuring beautiful meadows and woodland, bordered on two sides by the upper reaches of the Helford River in Cornwall. It was a gathering of all ages to celebrate 45 years of Resurgence Magazine and all that it stands for. Guest hosted by Satish Kumar, the event featured a diverse selection of outdoor and participatory art, live music, performance, inspirational speakers and local food to represent and promote the possibility of a positive, healthy, sustainable and joyful future – a future that is very real and attainable. Above all it was a celebration! 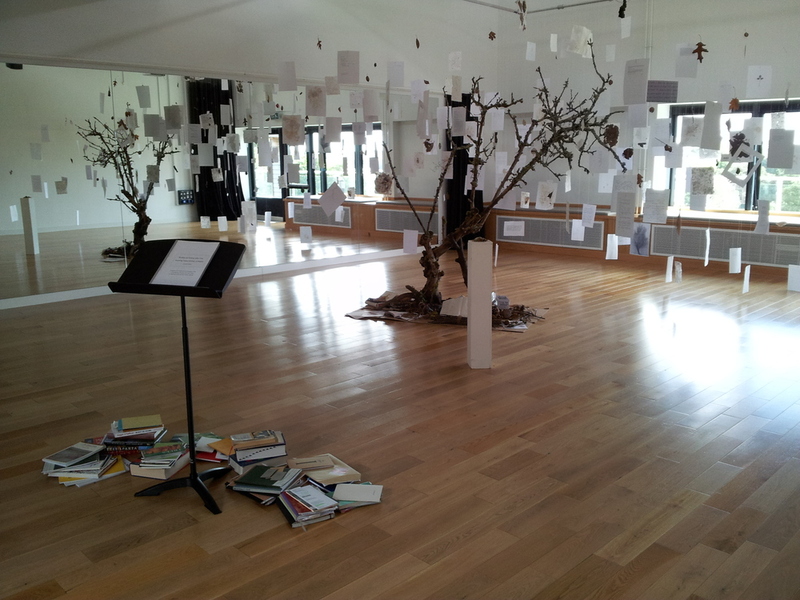 Blossom Works (2011) was an excercise in reading and writing with a tree as part of my PhD practice-based research project. I took fragments of other poets' works, for example Sarah Riggs' Chain of Miniscule Decisions in the Form of a Feeling (2007) - pictured here - that I particularly admired or felt fitted in the context of the tree and inserted these fragments between the blossom buds. As the blossom bloomed, so the reading of these fragments was affected. Some fragments fell to the ground, some fragments were partially or fully obliterated. This was part of an exercise in finding a language that felt right in this tree and an investigation of how other-than-human agency affects human reading and writing practices. A is For (2010)is part of a series of wire writing installations I made as part of my pactice-based PhD in 'Reading and Writing with a Tree: Practising "Nature Writing" as Enquiry'. These installations were made in an apple tree in Tremough Orchard, part of Falmouth University, in Cornwall. 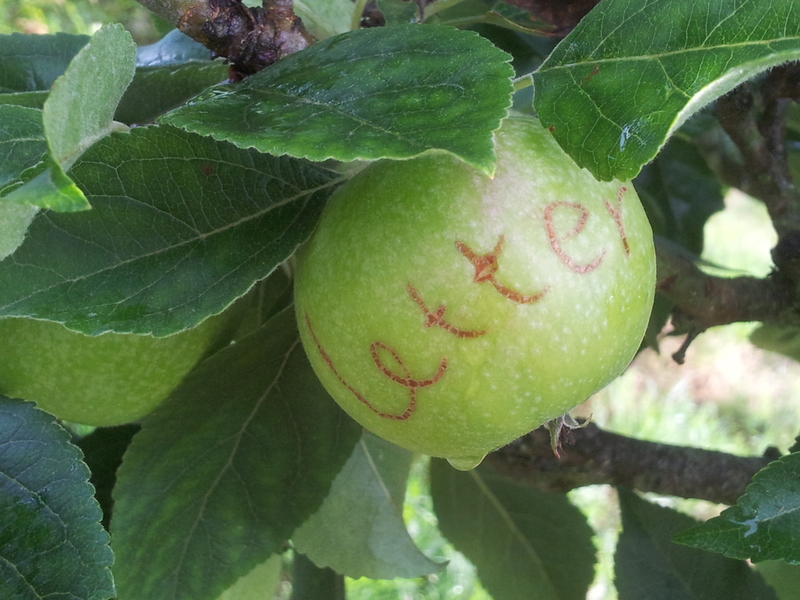 Apple Tree Poetry (2011 - ongoing) shows fragments of the Apple Tree Poetry (2011) that formed part of my PhD practice-based research - 'Reading and Writing with a Tree: Practising "Nature Writing" as Enquiry'. I began this experiment by bruising into the skins of apples on my desk. I noted that as time passed the bruise (writing) got darker, until the bruise consumed the apple entirely making the writing only partly legible. I tried this experiment on an apple on the tree and the marks scarred over. 'adverb' and 'verb' were two f my first experiments with this technique. The following year I wrote into every apple on the tree. The words distort and sometimes disappear (heal) in part as the apple grows. As the apples grow, gain weight and fall, the place each apple occupies in the poem shifts. This mobile other-than-human poem work forms part of an ongoing investigation into language-making as human and other-than human intra-action. The apple tree I made this work with initially is situated in Tremough Orchard, part of Falmouth University, in Cornwall. 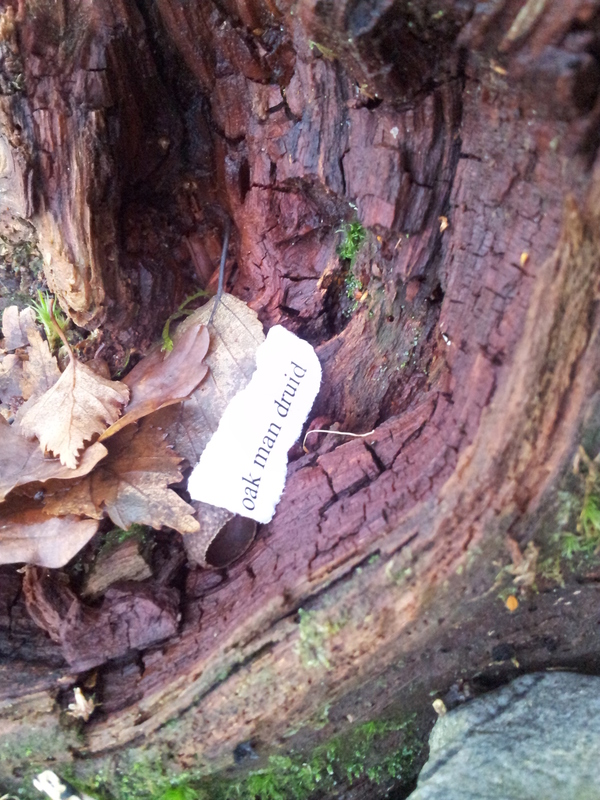 The later work, from which 'letter' is taken, was installed into a tree in my parent's garden. This project is ongoing. Telephone (2011) was created as part of a John Hall Performance Writing workshop at Plymouth University.